There are approximately one million active forklifts in the United States. It is estimated that 11% of all forklifts will be involved in some type of accident each year*. Organizations like OSHA set regulations to make working conditions as safe as possible, but accidents still happen as a result of improper training, distracted operators, and malfunctioning equipment. If companies implemented more stringent training policies, OSHA estimates that about 70% of forklift accidents in the US could be prevented. Training is the first step in forklift safety. Not knowing how the forklift works or proper protocol for carrying loads is an accident waiting to happen. Additionally, new inventory, obstacles, changes in floor gradient, or nearby pedestrians can all cause problems for inexperienced operators. — FIX: Provide training – OSHA requires that every forklift operator be trained and certified to operate a forklift, and the operator’s performance be evaluated on the provisions of 1910.178(l)(3) every three years. Forklift drivers often become too comfortable and drive irresponsibly. Traveling too fast on a forklift shortens reaction time and leads to accidents. OSHA advises drivers to stay at or below 5 miles per hour.– FIX: Slow down – Post speed limit signs around the facility, and make sure forklift drivers know the rules and follow them. This happens much too often. Driving with an elevated load makes it hard to see, the forklift harder to control, and can cause crashes or the forklift to tip.– FIX: Keep forks low – OSHA regulations encourage drivers to carry loads as near to the ground as possible, approximately 4 inches from the floor. Regardless of load, forklifts can tip. They turn with the rear wheels which causes the rear end to swing outward, increasing the chance of tipping during tight turns. — FIX: Slow down for turns – Turning a corner too fast can cause the forklift to tilt. To avoid tipping, slow down before the turn and maintain a gradual speed through the entire rotation. employees and visitors with ample signs and floor markings. 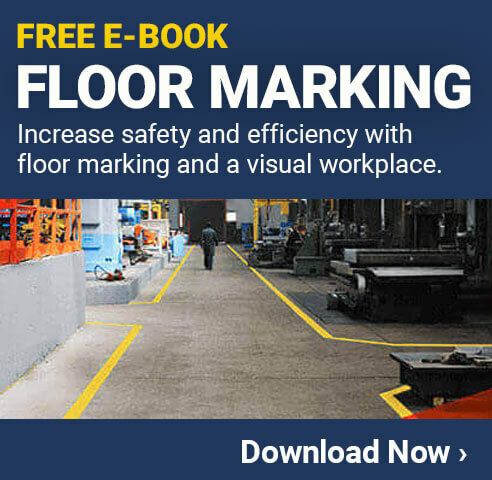 — FIX: Mark your facility – Floor tape and floor signs are the most efficient option for marking forklift zones due to ease of application and durability. Mark aisles, pedestrian walkways, ledges, traffic flow, and hazard areas. It may seem harmless, but riding anywhere on the forklift or forklift load that is not a proper seat can be extremely dangerous. It’s never a good idea to ride on the forks or use body parts to balance loads. — FIX: Only ride in proper seats – Never ride on the forklift anywhere that is not a proper seat. In addition, wear a seatbelt if one is provided. Even when operating a forklift safely and carrying a load as low as possible, vision can often be impaired which may cause accidents with pedestrians or infrastructure. — FIX: Drive backwards – If you cannot see past the load, drive the forklift backwards. Another major cause of forklift tipping is uneven and insecure loads. Things can go sideways fast when a load is unbalanced — FIX: Balance and tighten loads + angle forks up – When loading the forklift, make sure the load is secure and balanced on the forks. For additional safety, angle the forks up. Given the weight of the forklift and it’s loads, a mechanical failure can cause major accidents and injury. — FIX: Inspect the forklift regularly – At the beginning of each shift, follow a forklift inspection checklist to make sure it is in safe working condition. Wear appropriate PPE. Hard hats and reflective vests are often required in forklift areas. The average forklift weighs 9000 lbs. A runaway forklift can cause major damage. Set the e-brake! Many accidents can be prevented with training, proper floor marking, safety signs, and forklift operators using caution and following rules set in place for your facility.